Bijela-based new shipyard for super- and megayacht refit of the Consortium of Dutch shipbuilding company Damen and Porto Montenegro could start with the provision of services to its clients already by the end of this year. Over EUR 20 million will be invested during the first three years of operations in the company still known under the name Montenegro Yacht Services (MYS), and Bijela will, if all goes as planned, become a credible and competitive alternative to the existing reputable service centres and yacht refit shipyards in France, Spain and Italian west coast – it has been stated in an exclusive interview for the Vijesti newspaper, the first one given for the Montenegrin media, by Adriatic Marinas – Porto Montenegro Managing Director David Margason. The Government and the Consortium of Damen and Porto Montenegro have finally signed at the end of last year the Concession Agreement for the 30-year period for the commercial use of the Bijela shipyard port. The Dutch company and Porto Montenegro have been awarded the concession of 198,294 m2 of land and 281,077 m2 of Aquatorium. MYS will pay in return the annual fixed concession fee in the amount of EUR 123,303 and variable fee in the amount of 5% of EBITDA of the new company exceeding 5 million euros. The plan is to have during the first operational year in the new shipyard 14 superyachts repaired (yachts longer than 25 meters), whereas the number of yacht repairs in the fifth year will be 109. From 35 workers in the first operational year, MYS will grow to 300-400 workers in the fifth year of operations, and the former shipyard for cargo ships in Bijela will be transformed into a sophisticated technological centre similar to the specialized yacht refit shipyards in North Europe and able to provide all types of the most complex refit and conversion works on super- and megayachts from 25 to 125 meters in length. The contractual precondition for operations of MYS, which has already bought around EUR 2.65 million worth buildings and equipment of the former Adriatic Shipyard Bijela, is to have French company Valgo, engaged by the Government of Montenegro, complete the ecological remediation of the area by March 2020, which implies the removal of approximately 150,000 tons of grit and contaminated soil from Bijela. The Concession Agreement entitles MYS, if such a possibility exists, to start with business activity even prior to the completion of remediation. Therefore, our plan is to start with the organization of the entire system, to employ first workers and carry out preliminary activities, so that we start already by the end of this year with the provision of certain types of repair services in Bijela, which can be carried out on berthed vessels, without lifting them from the sea. We are thinking about working on larger yachts, already by the end of the year, which would be berthed along the main shipyard jetty on the west side, where the Adriatic Shipyard Bijela floating docks used to be. The plan is to offer, at the same time, the services of lifting smaller yachts from the sea by mobile cranes and the services of their repair. It all depends, however, on the ability to provide to our clients the highest possible quality of services, as good reputation and maintaining of a good reputation is the key thing for Damen. When can the arrival of a new floating dock be expected? The dock will arrive in Bijela during the first half of the following year. It is a completely new floating dock to be built by Damen that is in its final design phase, and the purchase of the materials for its construction has started. Since MYS will function in a way that a yacht lifted from the sea to the dock for repair purposes will then be transported by special multi-wheelers to the operational coast or to the workshops, the new floating dock must have a very sophisticated ballast system that will ensure its stability and the stability of the lifted yacht during sensitive moments of load and stability shifting, while yacht is transported from the dock to the coast and vice versa. At the moment there is only one so-called load-out and recovery dock in the world in Qatar. Additionally, our dock will have internal tanks for collecting water and material from the underwater part of the lifted yachts, so that when they are water-washed under high pressure to remove hull fouling all of these substances would remain on the dock and not spill into the sea, and they would be treated in a proper way in accordance with the strict ecological standards to be applied by MYS. We have already planned the position of temporary location and use of the floating dock until the remediation of the shipyard is completed. In the meantime, necessary construction works will be carried out to install the dock into its permanent position, as well as strengthening of the operational coast and platform within the shipyard, so that they can withstand considerable loads of ships having several hundred tons moving on transporters along them. The new dock will have the lifting capacity of 3000 tons and will have a modular structure, which means that, if necessary, it will be extended by simply adding new sections, up to the total length of 150 meters, and will have its lifting capacity increased up to 7,000 tons. Later on, the shipyard capacities will be improved by the construction of a new travel lift. The Business Plan states that MYS will concentrate on repair of yachts made of steel and aluminium having over 30 meters in length. Does it mean that you are going to fully eliminate the possibility to do a refit of smaller yachts made of composite materials and wood, thereby depriving yourself of a good segment of the market, as such yachts are now prevailing in Montenegro? Yachts below 30 meters are not our main target market for the future MYS development. However, we have not excluded the possibility to do the refit of smaller glass-reinforced plastic or wooden boats as this can be done by specialists/sub-contractors at the time we have free capacities. There is an increasing number of large yachts made of glass-reinforced plastic, having up to 40 meters in length, being under construction around the world, so there is no reason not to work on such ships or ships of wooden structure. At the end, it is not a large market and earnings generator, so that the economic basis and majority of work at MYS will be focused on larger yachts made of steel and aluminium. We count on yachts staying in Porto Montenegro to be our main source of business, at least at the beginning, but also on yachts staying in other marinas in Montenegro, since marinas are built in Lustica Bay and Porto Novi. Bearing that in mind, and the competition on the West Mediterranean and Adriatic Coast of Italy, as well as the number of mega- and superyachts currently cruising around the Mediterranean, we count on around 375 larger yachts from the entire Mediterranean, as potential MYS clients. There are 50 only Amels superyachts now on the Mediterranean, and since they are Damen’s brand, it is logical to expect that they would use the services within the warranty period or services of repair outside the warranty period provided by the single Damen’s shipyard in the region – the one in Bijela. We will be refit hub for Amels yachts on the Mediterranean. Will the new shipyard be available for any other type of vessels in addition to yachts, for example for repair of the Montenegrin Navy ships or vessels of the Montenegrin Government institutions? I am certain that MYS will be delighted with the opportunity to dock or refit “Jadran”, a training sailing ship of the Montenegrin Navy, as its beauty and importance are an excellent recommendation for every shipyard. That is why we would always find the place and time and enthusiasm to do “Jadran” refit. However, from the very beginning, our position on this project has been that MYS will not be “hybrid” shipyard that will deal with cargo, war or any other type of ships, except for yachts. It will be exclusively the shipyard for yacht refit and conversion, as this is the only way we can guarantee the highest level of quality of our services to yacht owners. How will Damen and its existing contractors around the world impact the development and capacity of the new Bijela shipyard? We believe that the key value of the new Bijela project is the reputation and quality associated with Damen’s name around the globe. Its internationally recognized skills in the area of construction, building and refit of all types of yachts, and especially mega- and superyachts through their Amels brand that is one of the three strongest brands in the yachting industry in the world, make the arrival of Damen in Bijela not only excellent news for Porto Montenegro but also for Montenegro in its entirety. It opens the entire new set of opportunities for the improvement and development of the Montenegrin economy, revival of the ship repair activity with a great tradition in the Boka Bay, and also the growth of the cluster of the Montenegrin companies, which could, provided they satisfy strict quality requirements, as well as requirements regarding prices and deadlines set by Damen, get involved with its products and services in the chain of MYS contractors. We want people to talk in the future about the Adriatic as new Riviera (Cote d’Azur in France and part of Tyrrhenian coast of Italy – the author’s comment), which has been so far the main yachting point. The things in the industry have started to move slowly from the West Mediterranean to the east, and Montenegro and Croatia, primarily, are becoming increasingly interesting and recognizable as destinations for staying of yachts and cruising. We have already initiated, together with our partners from Croatia, Serbia, Slovenia and Montenegro the Adriatic Yachting Association (AYA), so that, by having better connection of prominent companies, we can improve yachting services in the region, have joint actions, support partner companies and become lobbying force on the Mediterranean. There is no reason for the Adriatic not to become in the foreseeable future equal to the Riviera. A very important step to contribute to the above-mentioned is to increase the global awareness about the technical capacities of the Adriatic region in the area of mega- and superyacht refit, having Damen in this region, and our project in Bijela. You have noted in the Business Plan that MYS should be a credible alternative to services of ICOMIA group for superyacht refit on the West Mediterranean, but also to much nearer and “more dangerous” competition on the Italian Adriatic Coast, such as ISA in Ancona. How do you plan to achieve it? We will fight the competition with quality, deadline compliance, acting within the available budget, with good prices and of course by worldwide Damen’s reputation. From the engineer and technological aspect, MYS will not compete with yacht refit shipyards on the West Mediterranean, but with those in the North Europe – Holland and Germany that are the world leaders in this industry. The goal is to bring, through MYS, to the Mediterranean the North European quality measures for the industry, and we can definitely do it with partner such as Damen. Damen’s shipyards are located all over the world, and they have succeeded in creating adequate work ethics and attitude towards the work even in the countries where it did not exist, such as in Vietnam or Romania. 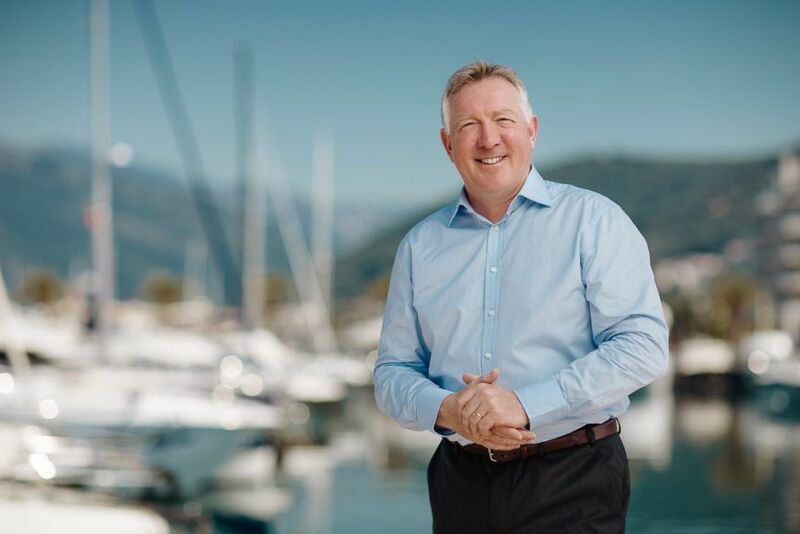 I am 100% certain that Damen will succeed in achieving the same thing here in Montenegro, as it is simply out of question to have Damen manage a shipyard or plant that fails in providing the services according to the highest standards and the highest level of quality. Although people make jokes here, including your Prime Minister, about the alleged laziness of Montenegrins as workers, my experiences are completely different – I have personally experienced that when people are given right opportunities, they are very hard-working and satisfied that they can show what they can do. I do not see any reason why the same thing would not happen in this case as well, primarily because people working in the technical area and ship building industry in general have completely different phycology and attitude towards the work, especially if they come from the industry working for the needs of the military, as it used to often be the case on the territory of former Yugoslavia. Level of discipline and work ethics at such companies is as such that cannot be often found in classic civil companies, and here, luckily, we still have a lot of people who used to work, for example, for Arsenal in Tivat. They, as well as the workers of former Bijela shipyard, with the global training programs that Damen and its contractors will offer them at their shipyards around the world, will certainly be able to satisfy the needs and requests of MYS. The main and most talked about topic regarding MYS with my partners from Damen is the training and education of the staff, and I am certain we will succeed in doing that with the people who are still here and have the skills, but also with the Montenegrins who used to work for Arsenal or Adriatic Shipyard Bijela but left to work abroad from Singapore to Dubai to North Europe, who would want to come back and work in their country. In the beginning, they will, of course, work with a certain number of foreign experts brought by Damen, but as the level of capacity increases for the local engineers and workers, this ratio will slowly change for the benefit of local workers. Can MYS, and if so how, contribute to the improvement of the Montenegrin economy and development of capacities of the local industry that is currently almost non-existent? The shipyard will be managed by Damen and Damen will evaluate what is the best for the company to meet the fundamental and key criteria that Damen operates on: high quality, fair prices and good planning, meaning strict compliance with the set deadlines. The goal both for Damen and us is to have the shipyard, when opened, rendering absolutely best quality services of yacht refit in the entire Adriatic region. No compromise is allowed with that respect, not even short-term, as this could lead to unrepairable long-term damage to the entire venture. There is no doubt that the new shipyard would like to cooperate with the local manufacturers and suppliers wherever possible, as it is simpler and cheaper, but it up to the local suppliers and providers to bring their offer, materials and services to the required level of quality in order to be able to work with Damen. Everyone able to do it is welcome!